There are two reasons I’ll never appear on the Discovery Channel’s Naked and Afraid. Two, walking barefoot everywhere. Who cares about being naked? It’s the shoeless thing that would do me in. I like going barefoot through the carpeting in my living room, not over rocky terrain or alligator infested waters. I admire barefoot runners, but I will never be one. My Achilles heel are my feet (that sentence is a disaster for so many reasons, but you get my point, right? My feet are made of clay? My soft underbelly is my arches? How to best say this?). I have insertional Achilles tendonitis, intermittent plantar fasciitis and Morton’s neuroma (or, at least, I have self diagnosed myself with these maladies) and in order to cope, I spend a lot of money on expensive running shoes on the theory they make running less painful. In any case, I collect a lot of used pairs of running shoes, and this was no more apparent than last week when I was forced to empty the back entryway in order to remodel it. I found no fewer than eight pair of running shoes, all of which belonged to me. See the thing with running shoes is that they wear out Most runners put no more than 500 miles in a pair of shoes. Until recently (when I’ve cut back on running — cut back, not eliminated — because of the aforementioned aches and pains), that meant at least two pair of running shoes a year for me. Given how much they cost in the first place, I couldn’t bear to just dump my surplus shoes in the trash. So I looked for a way to recycle them, and I found the MORE Foundation Group — Modular Organic Regenerative Environments. MORE collects gently used athletic shoes, sells them and then uses the proceeds to plant thousands of trees around the world (it’s a little more involved than that, but you can check out their website if you’re interested in grand vision; we stick to personal transactional details here). Trees, as any kid knows, offset the carbon in the atmosphere, and it’s hard to hope for more than that with shoes that would otherwise end up in a landfill. All of this explanation and whining is to say, if you, too, have used athletic shoes cluttering up your entryway, click here to find the nearest donation site. Question: How did you spend this fine Sunday? A. I drank too much sake with my sushi last night so I slept in and spent the day dozing on the couch while binge-watching Chopped. B. I read the Sunday paper cover to cover and spent the afternoon working on the crossword puzzle while half-listening to the baseball game. C. I went to church and spent the afternoon shopping for potted plants to hang in my porch. When I got home, I discovered a May Day basket hanging from my front door knob. D. I moved every last winter coat, used tennis shoe, spaghetti noodle, kibble of dog food and bottle of laundry detergent out of the pantry, swept the room three times, scrubbed the nooks and crannies of the shelving and got on my hands and knees to clean the baseboards in preparation for an epic paint job. Most common answer is A (because nothing says Saturday night like drinking too much). Lovely ways to spend the first day of May? B or C. But if you answered D, you’re on the same wavelength as me. We’ve lived in this house nearly nine years, and it’s finally time to makeover the pantry. The room comprises 128 square feet, and it’s also home to the back entryway and the laundry room. The multipurposefulness of the room contributes to a schizophrenic decorating vibe. 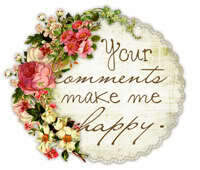 A cute “welcome” message hanging over the door complements the cluttered food containers bursting out of their shelving. A duplicate of nearly every kitchen appliance (slow cooker, blender, hand mixer, coffee grinder — we might need them someday, after all) fights for space with tin foil, refrigerator water filters and cleaning supplies. A functional laundry center sits next to closet filled with sandals and boots, coats and jackets for every season. One cannot fully fathom one’s tendency towards hoarding until one consolidates the contents of one’s pantry and realizes she has more than two dozen light bulbs, over 20 pounds of pasta in every shape and at least eight pair of running shoes. Nine jumbo rolls of paper towels? Check. Seven kinds and flavors of nuts? Check. Five different kinds of pancake mix (regular, buttermilk, heart-smart and two brands of gluten-free) and five types of oatmeal (old fashioned, minute, Irish, steel cut and single-serving packets)? Check and check. Once my Beloved and I removed everything (including the washer, dryer, shelving and quarterround), the formerly crowded room looks cavernous and echoes like an empty warehouse. I replaced the 60 watt bulbs in the light fixture with 100 watt bulbs, and now every scuff, flaw and stain on the walls stands out like neon advertising reminding us why we undertook this project, which will include painting the ceiling and closet in addition to the walls and installing new flooring to replace the, ugh, linoleum. 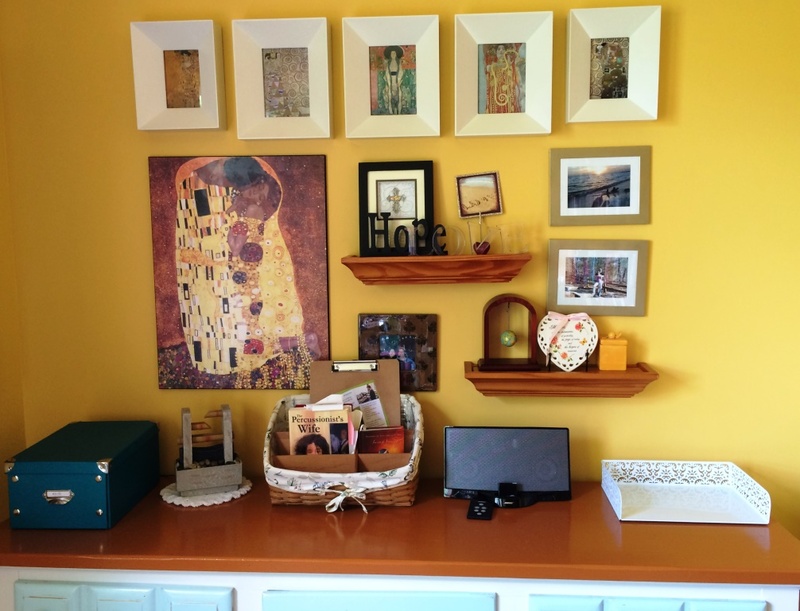 As with every room makeover undertaken at Minnesota Transplant’s house, a paint job blossoms into so much more. We’ve already invested in baskets to spruce up the pantry shelving and we’re thinking about installing cabinets above the washer-dryer. Dad is working on a new shelf with coat hooks, and I’m going to paint the foot locker. Oh, and new rugs. Of course. Who, I ask you, puts old rugs on new flooring? I’m exhausted as I recount this, but oddly invigorated. Nothing inspires like clearing away years of dryer lint and filling one’s trunk with items for Goodwill. Even as I slouch at my computer, I feel so much cleaner and lighter. A perfect project for celebrating the first of May. Hope however you spent it was equally as satisfying. I’m admitting this deficiency, not because I am proud of my ability to procrastinate basic maintenance activities (yes, that is literally a foot of papers on the right side of my credenza), but because I know other people have piles of s*** on their desks, too, and I want to be a vision of hope for these a-messy-desk-is-a-sign-of-an-active-and-intelligent-mind apologists. 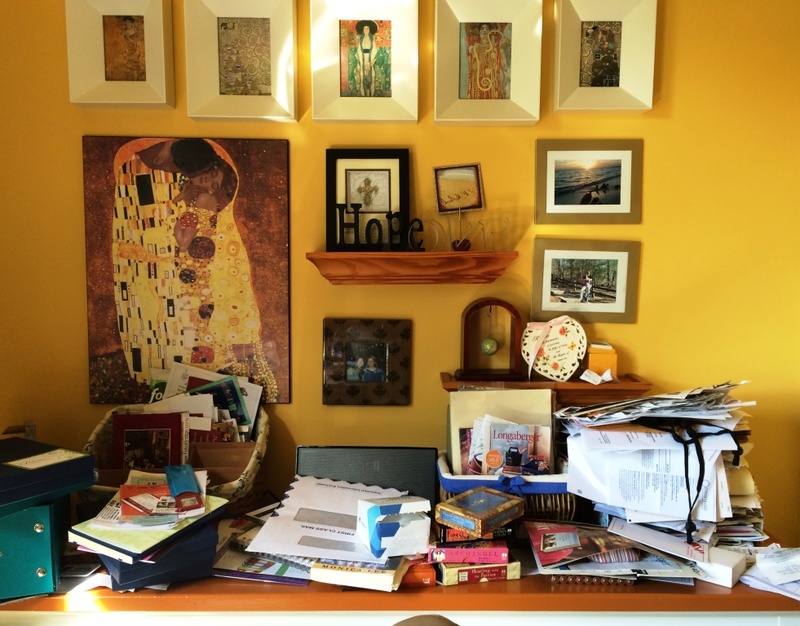 I actually spent an entire day last week filing “absolutely everything” in my office. This required not only hours, but several dozen manilla folders, endless inches of labeling tape and, in the end, a hefty bag filled with the chaff of six months of receipts, mail and pages torn from magazines (possibly more than six months; could have been eight months; or nine). Here’s to a brand new week without fifty pounds of baggage. I swear, this week I will tackle the cabinet in the bathroom filled with dried-up moisturizer and nearly empty bottles of conditioner. In conversation with a professional organizer I know, she mentioned she uses Costco Non-Slip Hangers whenever she organizes a closet. 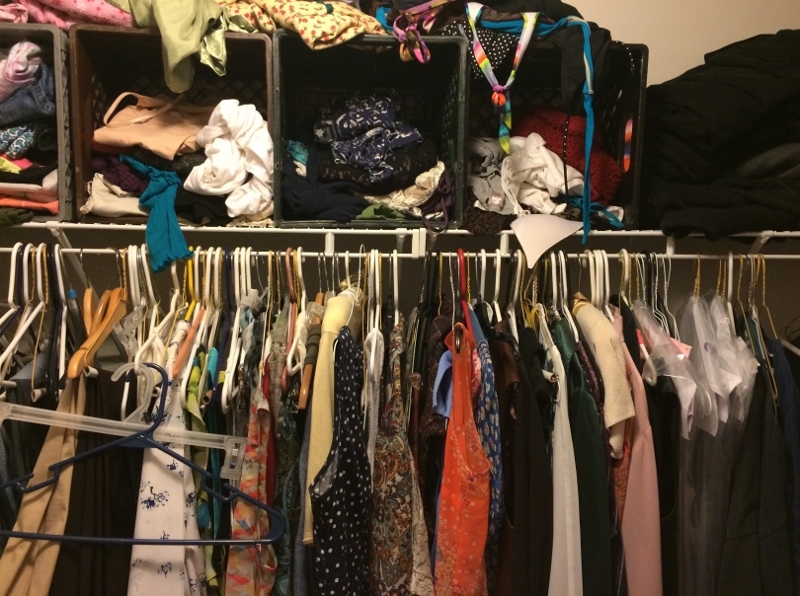 She argued with conviction that a closet wasn’t organized until all the hangers are the same. Well, I thought, a professional organizer ought to know good hangers when she sees them, right? So I invested in a box, and changed out some of the old hangers in my closet. Costco’s Non-Slip Hangers are amazeballs! They’re strong, thin and covered in a black felt-like substance that truly is non-slip. And they’re only $9.99 for a box of 35! After I used up the first box, I went back to Costco and got three more boxes, which is still less than I’d pay for a nice pair of pants. You’ve got to see these for yourself. I am now addicted to my closet. Every time I’m upstairs for any reason, I walk into my closet, flip on the light and bask in the order of it. Create in me a clean heart, O God, and renew a right spirit within me. Cast me not away from Thy presence, and take not Thy Holy Spirit from me. Restore to me the joy of Thy salvation, and uphold me with Thy free spirit. Any good church-going Missouri Synod Lutheran recognizes those verses as the offertory in the Sunday liturgy. I think it came to mind today because I was cleaning my clothes closet, an indication of my own disorder. 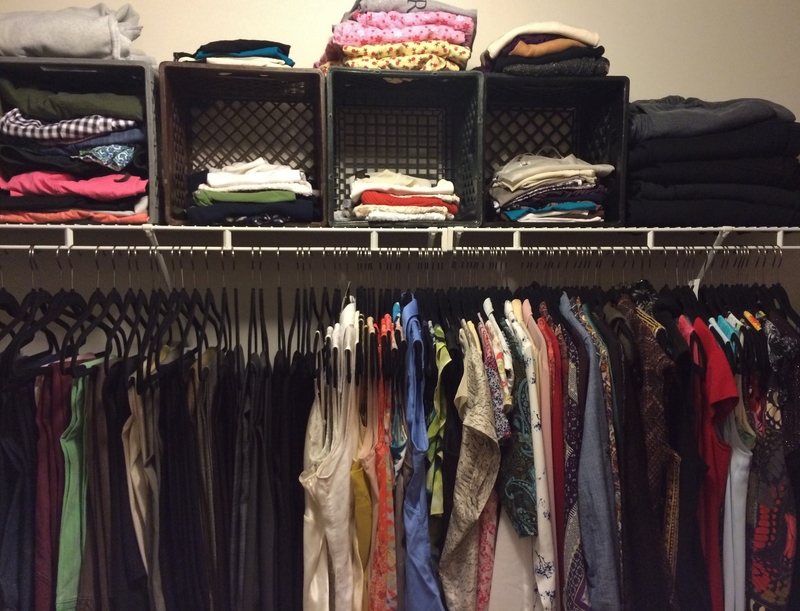 The closet is not yet good enough to show off in a stellar After picture, as is my wont, but it’s better. The overflowing closet itself is a symbol of abundance and the blessings I’ve been bestowed; the process of organizing it, a symbol of renewal. It’s rather nice to think of a common household task like cleaning one’s closets as bringing one closer to God. As part of the Grand Home Office Remodeling project, I’ve been sorting through my files. Yes, my paper files. I’m a dinosaur like that. Boy, did they take me back. Oh, Multiples and Hairdini-helped French Twists were the height of fashion and beauty in the 1980s! The only things missing are Bonne Belle Lip Smackers and Maybelline Great Lash Mascara. Dressing in theme for a Halloween party of spirit week? You can’t go wrong with shapeless jersey knit and tube belts. But wait! There’s more! I bought my Hairdini Magic Styling Wand from an infomercial, and it really worked! I had the best up-dos around. I wish I still had some of those Multiples, but timeless, they weren’t. Why I still have the brochure with tips on pairing pieces, I don’t know. Ditto for the Hairdini instructions because the Hairdini itself is long gone. Well, yes, I do know why I hang on to useless stuff long past its expiration. I’m a sucker with a hoarding problem who doesn’t understand the fallacy of sunk costs. But I’m forging into the future resolving to do better. Following the publication of this blog post, these brochures have officially completed their useful life, including this pointless foray of wistful nostalgia. I’m throwing them away. I know a man who doesn’t pay to have his trash taken out. How does he get rid of his trash? He gift wraps it, and put it into an unlocked car. 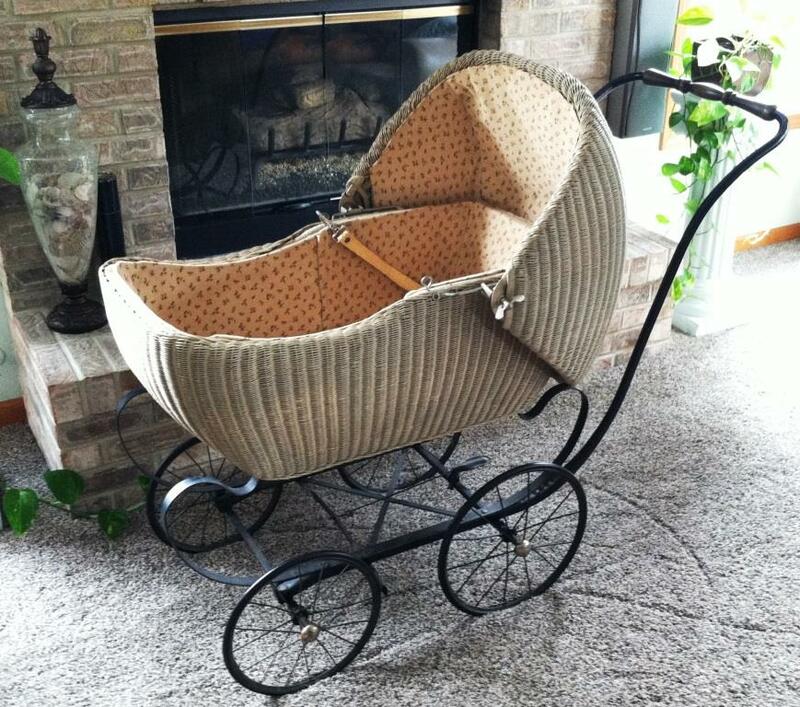 Which is why this lovely baby buggy, circa 1917, is being auctioned on eBay. It’s a real antique, meaning it carried a real baby around some Illinois neighborhood just a few years after the Titanic went down — that’s nearly a century ago. My mother-in-law once used it in a window display at a shoe store back when people bought children’s shoes at downtown retail locations where employees actually measured their feet. It was being stored at our house and, um, its time is up (we’re planning to do more room painting if you must know). It’s in excellent condition considering its age (I can only hope my rubber wheels hold up so well). Interested in a shabby chic accent piece to store your guest pillows? Check it out here. You just might have to have it.